The traditional practice of urban design was that the house would show its best side to the street and engage and welcome the visitor and passer-by. The rooms inside the building would match this by having the reception rooms facing the street façade and by being recognizable in the fenestration and with suitable detailing of the front. This attitude was maintained throughout the 19th century in spite of the noise of the horses and horse-drawn vehicles, and of the hub-hub of pedestrian crowds and the cries of the peddlers. With the increasing wealth and the increasing demonization of the urban environment as filthy and unhealthy the urban middle classes removed themselves to the suburbs, but initially maintained the style and expressiveness of their dwelling emulating the rural villas of their much richer role models. The generally generous lots gave the space to place the house at a distance to road and from each other and to produce a park-like environment in the early and the more expensive suburbs. The arrival of the car and the much broader city exodus of the early 20th century changed the equation as the houses became smaller and streetscape less interesting and the actual and even more so, the perceived accident risks greater. While many American suburbs maintained a public face through porches and porticos, the reversal of the order began: entry from the back via the garage, entry via back alleys now used by the house owners and not as earlier by the servants, coachmen and delivery boys. In Europe both apartment blocks and suburban houses began to reorient their internal layouts towards the garden in the back. The new desire for maximum sunlight invited a flowing transition from the ground floor living room into the garden instead of a first floor reception and dining room with kitchen and pantry on the ground floor together with the servants. In this context of changing patterns of externalities, increasing expectation of quite and sunlight, the New York designers Clarence Stein und Henry Wright went one step further and reversed the order completely. Their 1928 design for parts of Radburn, NJ opened the house to a common park, which flowed into the garden of the house. The front entry would be from a cul-de-sac accessible garage and parking space. The residents and in particular the children could walk away from the cars to their destinations, as the different parks were linked by suitable underpasses and overpasses to avoid the streets. 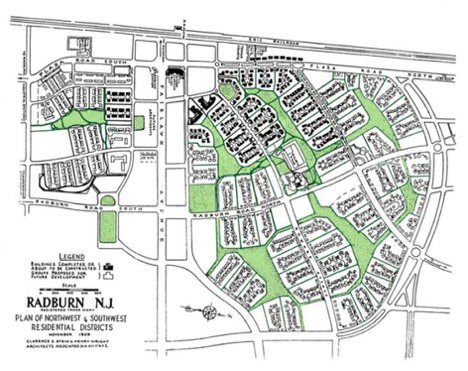 The original design covered only a small area, but the design idea was applied at much larger scales in many post-war suburbs around the world. At this scale it became clear, that the loss of the streetscape was in many cases not balanced by an active communal use of and life in the parks. Many gardens gates were locked, the view into and from the park was blocked by hedges and fences.